Briar Rabbit recently introduced Chicago to their new EP, Briar Rabbit and the Company You Keep, by playing to a packed room at the Whistler. I missed the show, and based on the reaction, was quite sorry I did. Luckily I got my hands on the record. Phillip-Michael Scales, the singer-songwriter behind the curtain, is new on the Chicago music scene. He moved here this year after studying music in Boston, and the album is a collection of seven songs recorded between the two cities. It highlights Scales' contemplations with a diverse series of pop songs about leaving one place headed for another. Opening track "Numbers" starts minor as a gypsy trot before opening up, and throws in a great solo that crosses genres and foreshadows Phillip-Michael's ability to jump smoothly from Elvis Costello and Ben Folds-esque melodic songmanship to darker laments and back over the course of one tune. The excellent "All My Words" rolls along on a beachy bassline like a really good conversation had while cruising down the coast. When Scales sings "keep it casual or be a casualty," one gets the distinct impression that the discussion is all the more genuine because of the sadness in his voice. Both the lead vocals and the instrumentation on Briar Rabbit and the Company You Keep have the ability to be gentle without sounding weak, and that gives the album its most powerful moments. The songs are vagabonded and yet have a solid base in the tight, live-sounding performance and production, and in Phillip-Michael's songwriting expertise. This collection of road tunes leads me to wonder: what might the young songwriter have to say about finding his place in Chicago? 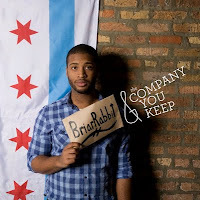 'Briar Rabbit and the Company You Keep' is available in both physical and digital form via Bandcamp. You can check out Briar Rabbit live on May 12 at the Abbey Pub (also with 3 in Counting and Meagan Hickman; details here).